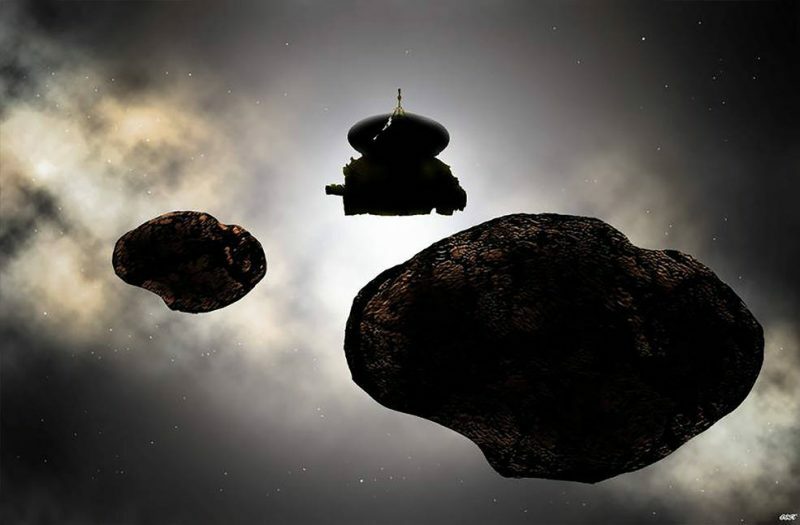 Last week NASA released a video compilation of New Horizons 2015 landing on Pluto. 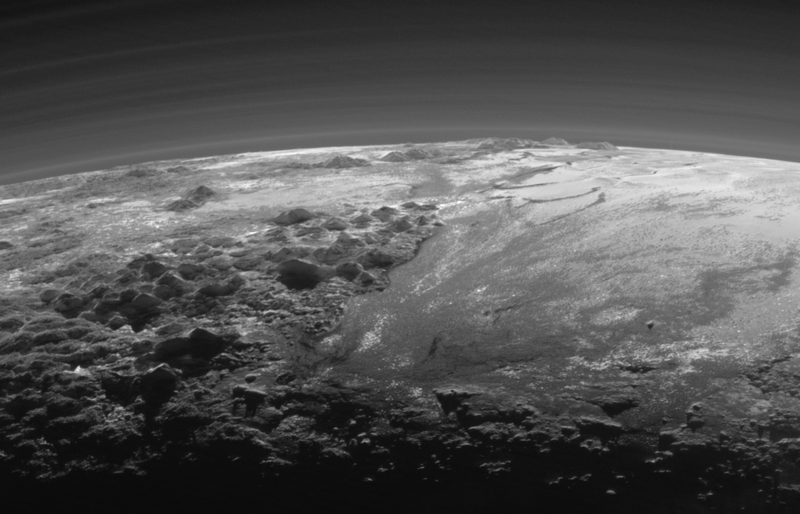 What would it be like to actually land on Pluto? 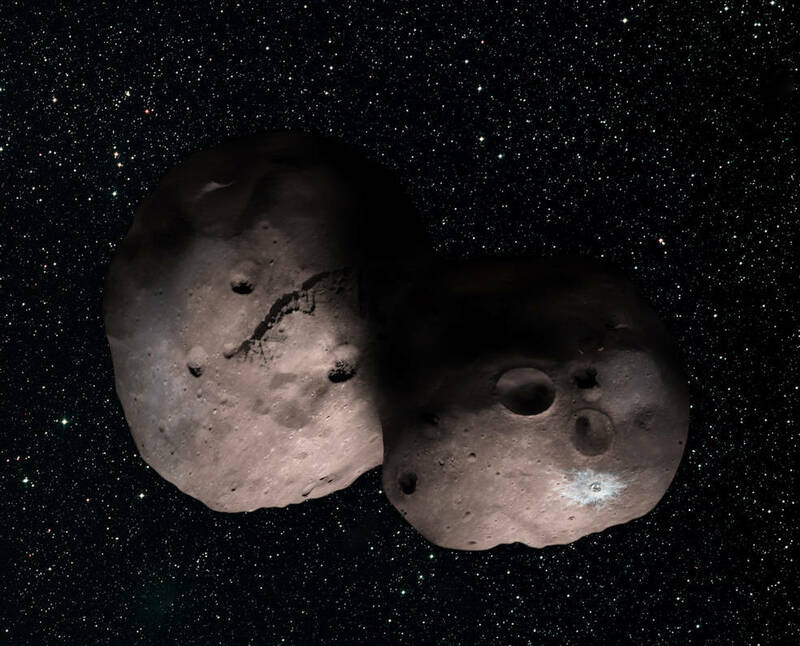 This movie was made from more than 100 images taken by NASA’s New Horizons spacecraft over six weeks of approach and close flyby in the summer of 2015. The video offers a trip down onto the surface of Pluto — starting with a distant view of Pluto and its largest moon, Charon — and leading up to an eventual ride in for a “landing” on the shoreline of Pluto’s informally named Sputnik Planitia. To create a movie that makes viewers feel as if they’re diving into Pluto, mission scientists had to interpolate some of the panchromatic (black and white) frames based on what they know Pluto looks like to make it as smooth and seamless as possible. 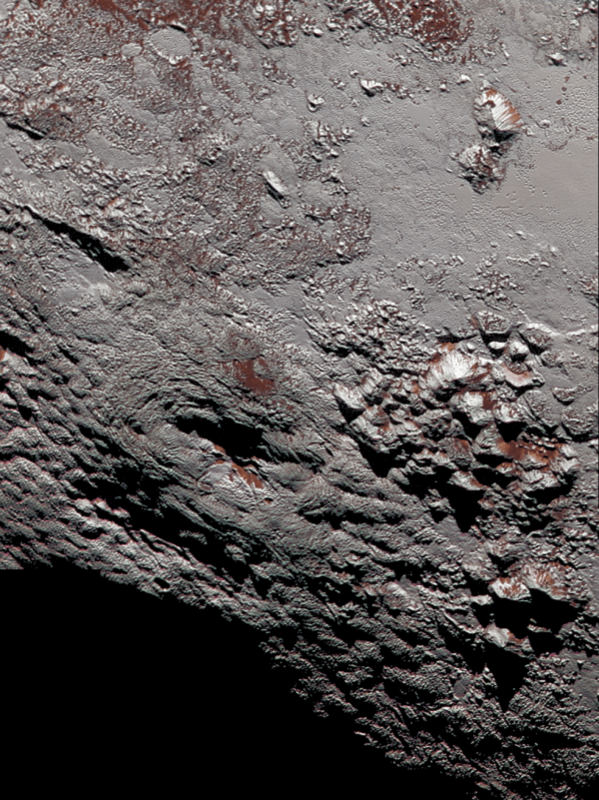 Low-resolution color from the Ralph color camera aboard New Horizons was then draped over the frames to give the best available, actual color simulation of what it would look like to descend from high altitude to Pluto’s surface. NASA’s New Horizons mission does it again – apparently Pluto has “floating hills”. 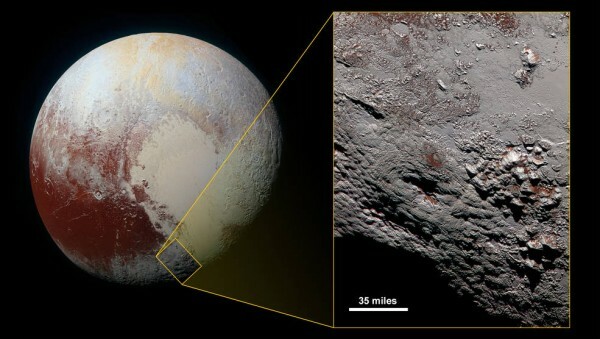 February 4, 2016 NASA released images captured by New Horizons, 12 minutes before closest approach to Pluto on July 14, 2015, at a distance of 16,000 kilometers. … likely miniature versions of the larger, jumbled mountains on Sputnik Planum’s western border. They are yet another example of Pluto’s fascinating and abundant geological activity. Because water ice is less dense than nitrogen-dominated ice, scientists believe these water ice hills are floating in a sea of frozen nitrogen and move over time like icebergs in Earth’s Arctic Ocean. 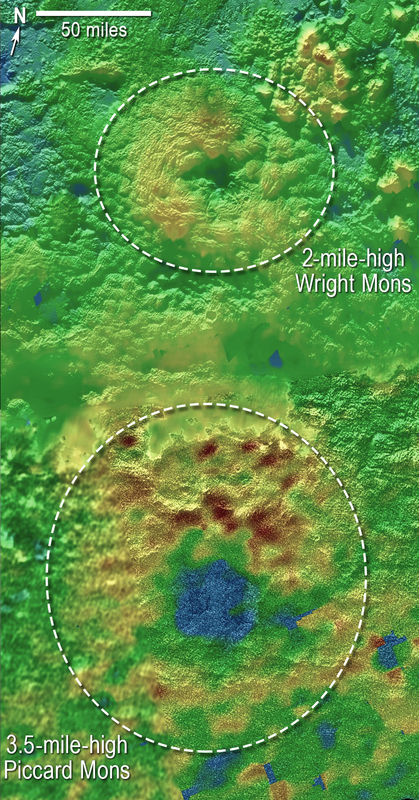 The hills are likely fragments of the rugged uplands that have broken away and are being carried by the nitrogen glaciers into Sputnik Planum. ‘Chains’ of the drifting hills are formed along the flow paths of the glaciers. View larger. 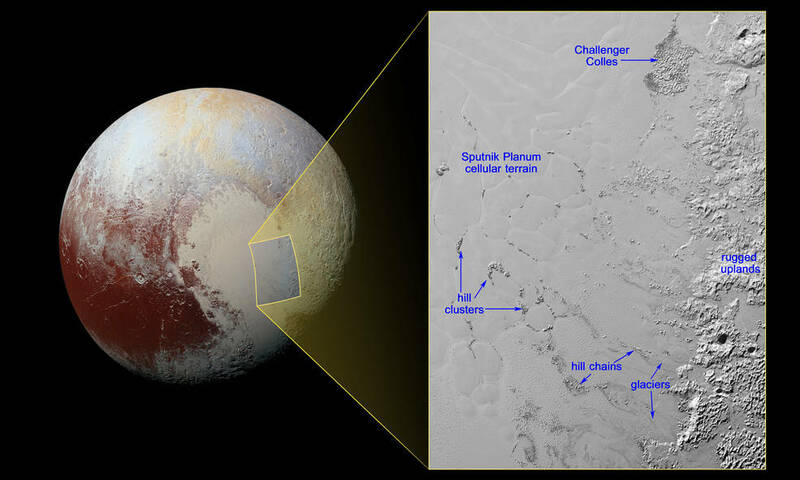 | Hills of water ice on Pluto ‘float’ in a sea of frozen nitrogen. They’re thought to move slowly over time, somewhat like icebergs in Earth’s Arctic Ocean. For the scale here, notice the feature informally named Challenger Colles – honoring the crew of the lost Space Shuttle Challenger. It appears to be an especially large accumulation of these hills, measuring 37 by 22 miles (60 by 35 km). Image via NASA/JHUAPL/SwRI.